When you enter the current exhibition Abstruction: The Sculpture of Erick Swenson, the first thing you see is this form, almost seeming to swim out of the shadows. The single metal rod holding the sculpture up is strategically placed so that it is not visible from some angles. That’s the kind of carefully considered detail that is a hallmark of Swenson’s work. For the exhibition, the museum commissioned the artist to create a work that would become part of its permanent collection. 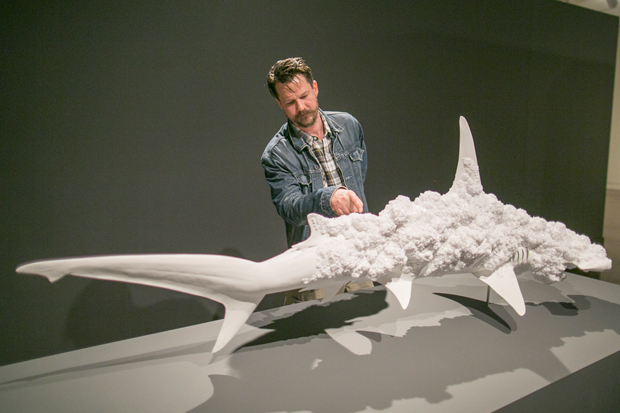 When the Dallas-based Swenson proposed a shark, the museum had to think about it first. Manō (sharks) are not only important members of the ocean ecoysystem, they are important members of the social and spiritual fabric of Hawaiʻi. Some manō are considered ʻaumākua, or ancestral dieties, who are thought to be guardians of certain fishing grounds and the ancestors of the fishermen and women of those waters. Interestingly, Erick Swenson was unaware of the manō’s significant place in Hawaiian culture when he proposed creating Present in the Past as a commission for this exhibition. The Honolulu Museum of Art carefully considered his proposal and ultimately arrived at the conclusion that the ideas behind this hammerhead shark sculpture are conceptually consistent with the revered status of the manō in Hawaiʻi. Made completely of resin, the striking hammerhead shark is encrusted in crystal-like formations—like it is being eaten alive by sparkling tumors. 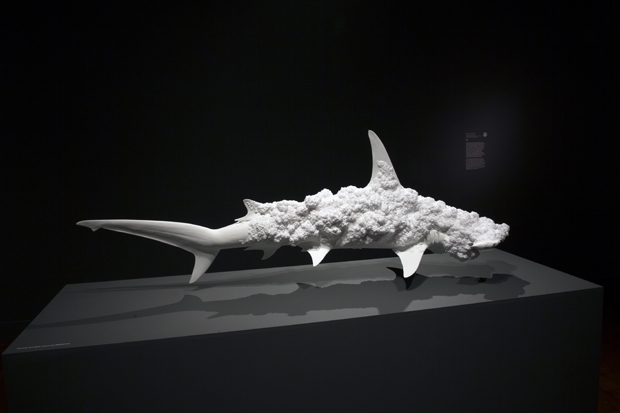 Swenson says that he originally had envisioned the geode forms being inside the shark—as with his work I Am What I Isn’t, a skull housing a geode. 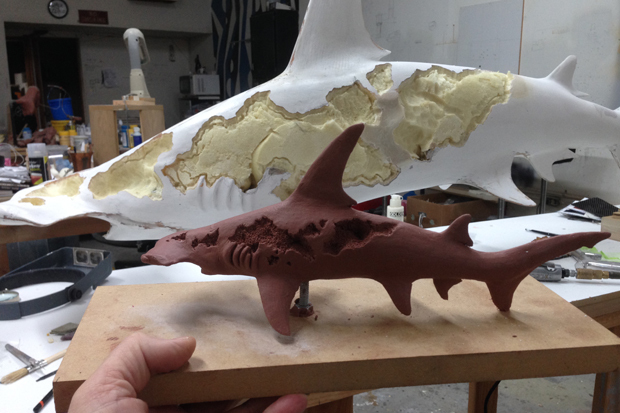 Maquette of an early version of the shark. You can see how the shark evolved in these later maquettes. He also had a version of the shark with the geodes on the outside in his sketchbook. When version one didn’t pan out, he turned to that. “It’s more of an eruption, a taking over, or invasive sort of experience,” says Swenson. Abstruction: The Sculpture of Erick Swenson is on view through July 29.